Tibetan Buddhist monks from the Drepung Loseling Monastery are constructing a sand mandala at the Carlos Museum now through Feb. 11. Photo by Myron McGhee. Hear audio of Tibetan monks painting sand mandalas at Emory as part of "The Mind's Eye" photo exhibit, now on display at Cox Hall Computing Center. The audio files include comments from the artist Myron McGhee and curator Juana Clem McGhee, among other Emory voices; as well as excerpts of the monks singing and the sound of the tools used in the mandala construction process. Access the audio with your smartphone at the exhibit by using a QR code reader app; or by visiting the online gallery and clicking on URL links to the audio files. 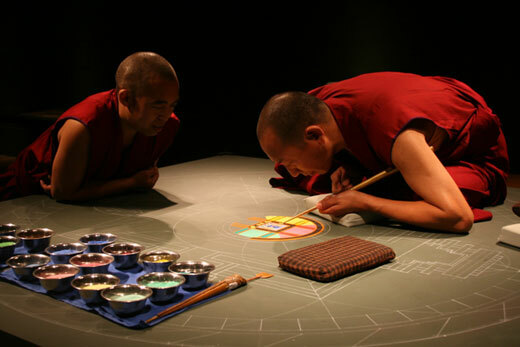 Watch the intricate and fascinating process of building a sand mandala going on now at Emory's Michael C. Carlos Museum. Members of the Emory community and the public are invited to come to the Level Three Galleries and watch Tibetan Buddhist monks from the Drepung Loseling Monastery constructing the sand mandala of Guhyasamaja during museum hours. Admission is free to Emory students, staff and faculty. During this time, the monks will place millions of grains of colored sand on a table using traditional tools to construct this intricate sacred art. Once completed the sand mandala will be swept away during the closing ceremony on April 15, a practice that symbolizes impermanence. The mandala construction is part of the special exhibition "Mandala: Sacred Circle in Tibetan Buddhism" through April 15. Museum hours are 10 a.m. to 4 p.m. Tuesday through Friday; 10 a.m. to 5 p.m. Saturdays; noon to 5 p.m. Sunday.